So much for my theory on having two girls in tutus! 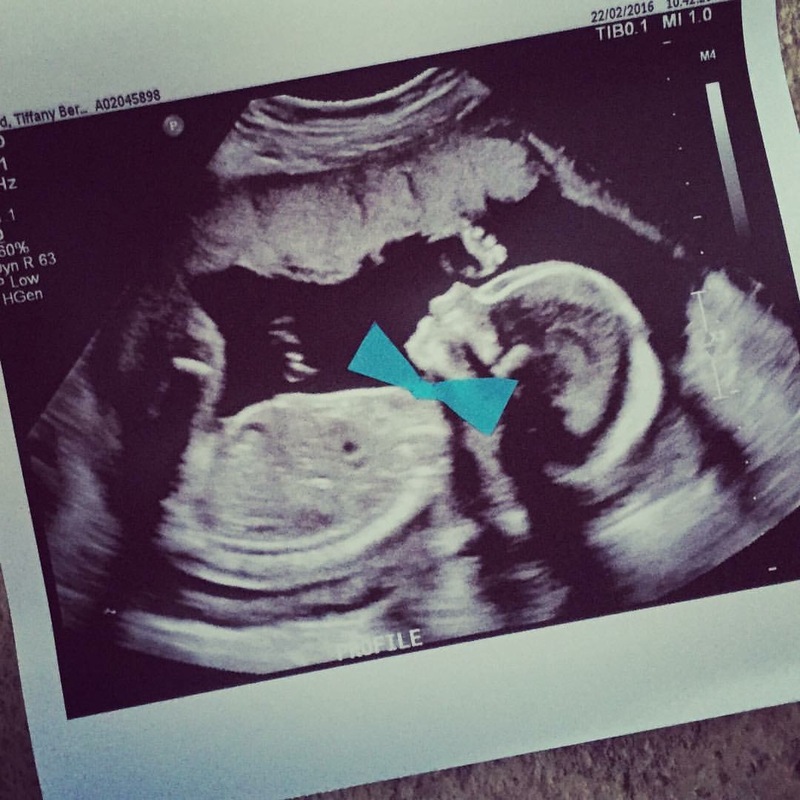 We had our ultrasound and appointment on Monday and got the big news that baby number two is a BOY! Of course we are so happy and excited! It was a bit of a shock to me, only because for so long I envisioned another little lady joining us. I am getting used to the idea of a little gentleman though. I am hoping with the warmer weather coming soon (fingers crossed!) that some cute boy outfits start presenting themselves in stores. Right now it’s a little lacking. It is probably better that way though, one can get carried away shopping for newborn baby clothes! I started going through Hallie’s clothes to sell consignment or give to goodwill. What an emotional process! 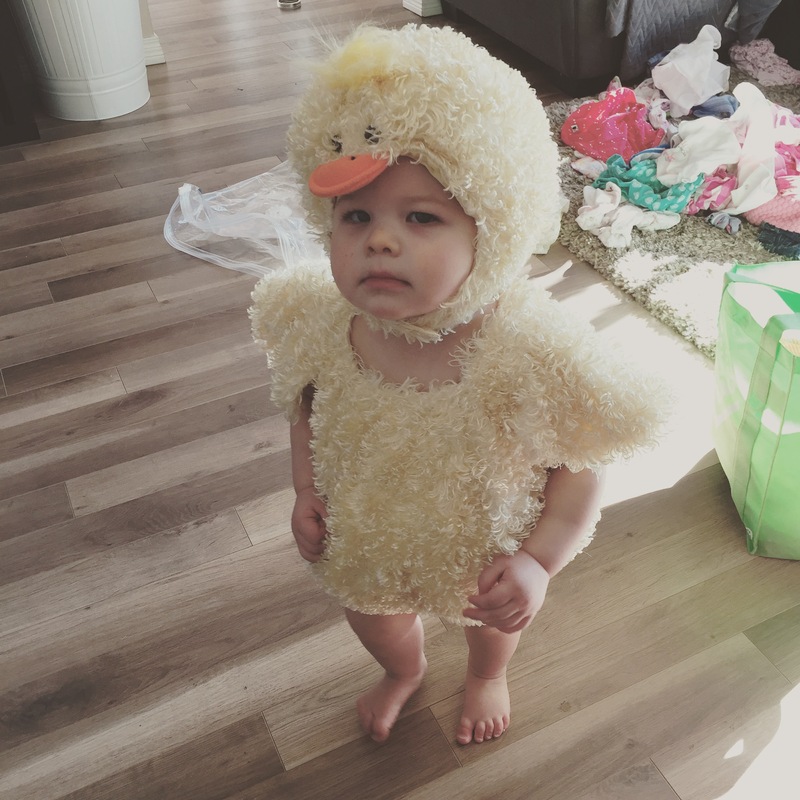 I have definitely shed some tears over her tiny onesies and adorable outfits. 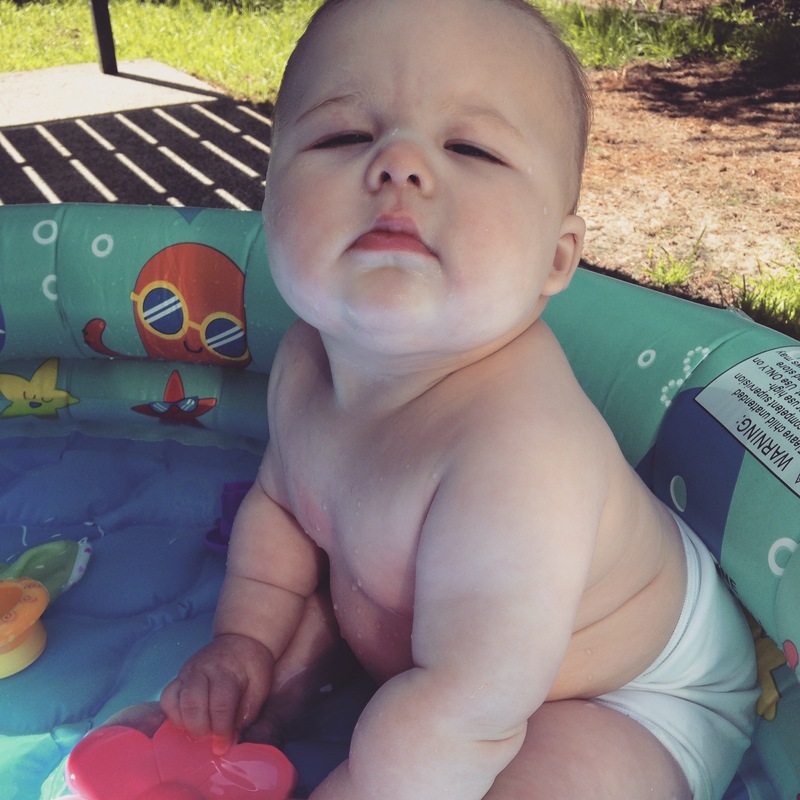 It is hard to believe my little girl was once so small! Where does the time go?! I blame a lot of the tears on pregnancy hormones too. Hubby has allowed me to keep TWO storage bins worth of my favourite baby girl clothes – I think he just felt so bad when he saw me on the living room floor over tiny pink Minimocs. So I have kept all my faves for baby number three…… yes I just said that! But for now, eye on the prize. Little man is joining us in four months! How quickly did that time pass?! We have had some real sunny days lately so all I can seem to think about is summertime, baby boy’s due date and how much fun we are going to have as a family this summer. With Hallie, I spent so much time planning her room and making sure we were getting everything we need. This baby doesn’t even have a room yet I am not too worried. I know there are a couple things I want to upgrade or get for this time round with a newborn. I just know that even if I don’t have everything or his ‘space’ (no room of his own so he get s space in my room hah) isn’t ready, we will be fine. We will be overwhelmed and it will be crazy for a little while but really, we will all be fine. We will all be loved. There happens to be a lot of love in this house! Just for fun, I thought it would be fun to share some highlights and lowlights of this current stage in my pregnancy. I am a little over five months pregnant so well into the second trimester. Cravings: Granny Smith Apples, Strawberries (actually any berry will do), Pepsi – all the time! So bad for you I know. Eggs with avocado and fresh ground pepper. WINE. Not that I indulge. But as soon as it’s sunny, I am salivating over thoughts of a chardonnay. As soon as it’s nighttime and I am sitting down to dinner, OR completely overwhelmed by the day with my cray cray toddler, I can’t help but envision a large glass of red wine. Overall I am really quite hungry all the time with this baby. Now that all of the morning sickness has passed! Feeling: Good! Again, now that the grossness of the 1st trimester has subsided, I am feeling quite good. Some daily exercise and stretching has proven to be a key factor in feeling good but so far that has been pretty easy to achieve chasing Hallie around. Oh and lots of water! I have been drinking a TON of water and I believe that is playing a huge part. Daily Challenges: Sleep. Pregnancy insomnia seems to settle in every few days. Which is the worst when you are exhausted. I seem to wake up at three in the morning and think about EVERYTHING UNDER THE SUN! It’s not necessarily worry or stress but that hamster sure is running on his treadmill at the worst possible moments. How I long to sleep. All the time. I guess I will when the kids are like 18 years old. Skin/Hair/Nails/Etc. : All women that I know have had exceptional luck during their pregnancies with hair growth. I am not in that circle of the lucky ones. My hair does not grow. In fact since my first baby, my hair seems to have thinned drastically at the sides. Hellion postpartum hair loss, lovely to meet you. You can piss off anytime! Nails seem to be doing okay. Skin is doing AMAZING! Though I do not thank pregnancy for that – I thank my daily regimen from Rodan + Fields with the weekly microdermabrasion facial for that. Oh and my eye cream! The results have been amazing so far and I have only been using the products since Christmas. LOVE! Thank goodness I sell it and get a good discount. So overall, looking like a glowing pregnant woman I suppose. Chubby middle and all! The downfall is this time round, I really have to make an effort to dress nice and not wear leggings EVERYDAY. With Hallie, I was managing a store, Anthropologie, and looking stylish was mandatory on a daily basis. Now I am working as a mom and there is no one here to raise an eye brow if I am still in my pjs at noon. I do try to dress up for most of the week. Not saying the ‘mom bun’ doesn’t present itself almost daily! Can’t win em’ all. Looking Forward To: More baby kicks! He has really started moving in there and each time I feel kicks I get a huge smile on my face. I am also SO EXCITED for sunshine and warmer weather. I have some very cute dresses that will show off this bump perfectly but I am gonna need that warmer weather to wear them. Not to mention a bit of a tan! We are early but we broke out the Easter Decor! 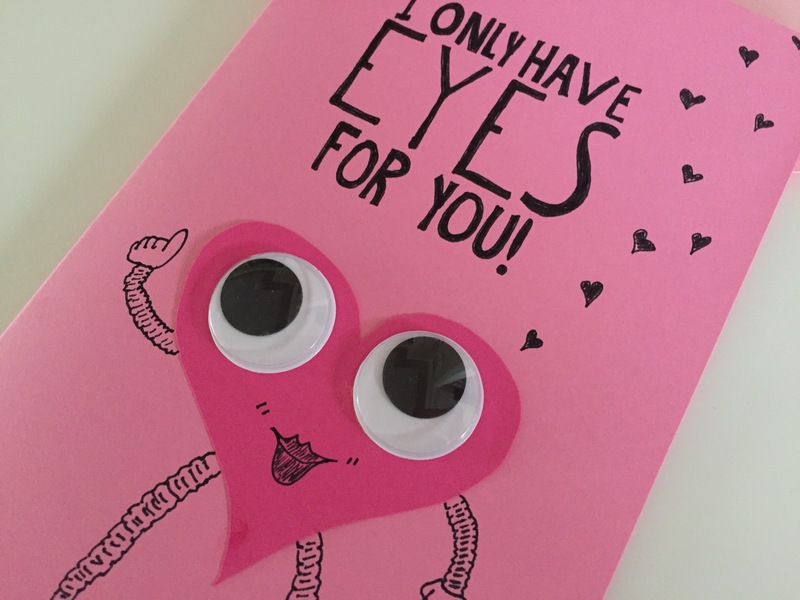 Have you taken a look on Pinterest for Valentines related pins? So many cute ideas! This Reeces Pieces idea would be perfect for my husband as he LOVES those chocolates to bits and pieces (see what I did there?!). I am also LOVING this decor idea with the branches and tiny pink hearts. Bit late now and I do not have any spare branches on hand, believe it or not, but a next year craft for sure! Lastly, these hearts are just cute to boot. I don’t know what I would do with them (maybe assemble a garland over the fireplace?) but I think they would be super fun and easy to make. Aside from a few heart garlands and some festive bouquets, my house is on the minimalist side for V-Day decor. Shame on me, better luck next holiday! What sort of decor have you selected to celebrate the loooooove? Though today was supposed to involve road trip prep and packing, Hallie and I spent most of the day cuddling, trying to get rid of our annoying colds. Hers more than mine unfortunately. FYI, when your child is not feeling well, maybe avoid giving them milk… It’s a real treat to have a curdled, cottage-cheese like liquid hurtled all over you as soon as you change out of the last shirt she spread her breakfast all over. So much for avoiding doing laundry before we leave! Poor kid… Despite that incident, she was mostly all smiles for the day. It’s amazing what Curious George can do. Between cuddles, I managed to get some serious baking and card making done. 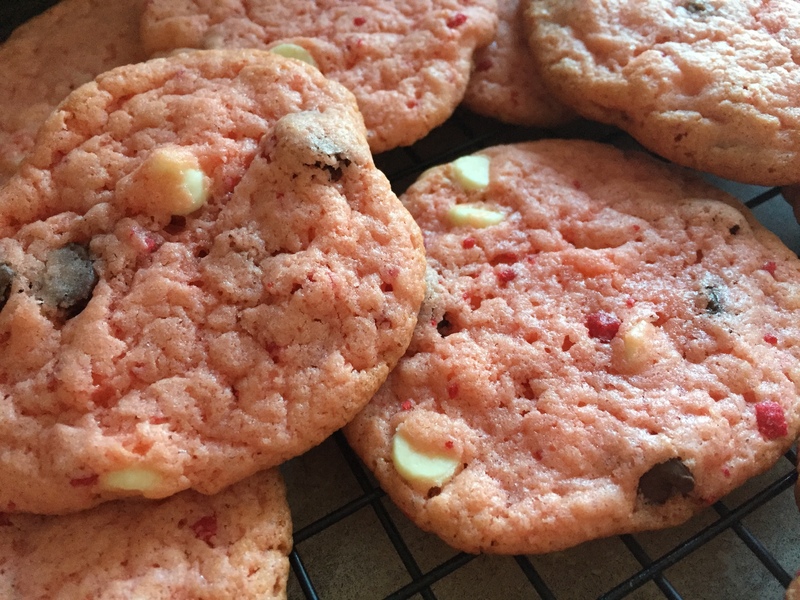 We made DELICIOUS strawberry shortcake cookies with chocolate chips (recipe here), home-cooked sweet potato for Hallie’s dinners this weekend, and cheese and chive scones with a melted butter glaze. YUM! 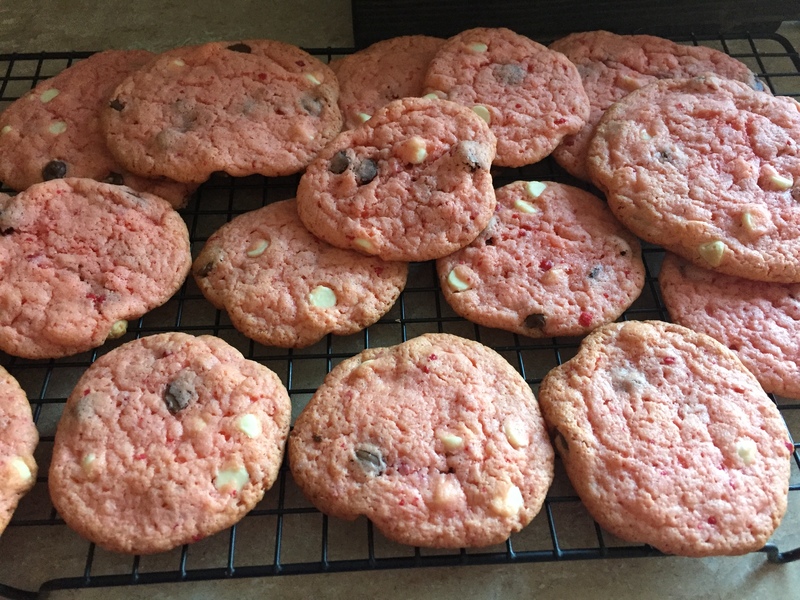 They were intended for the drive up but I promise you they won’t last. 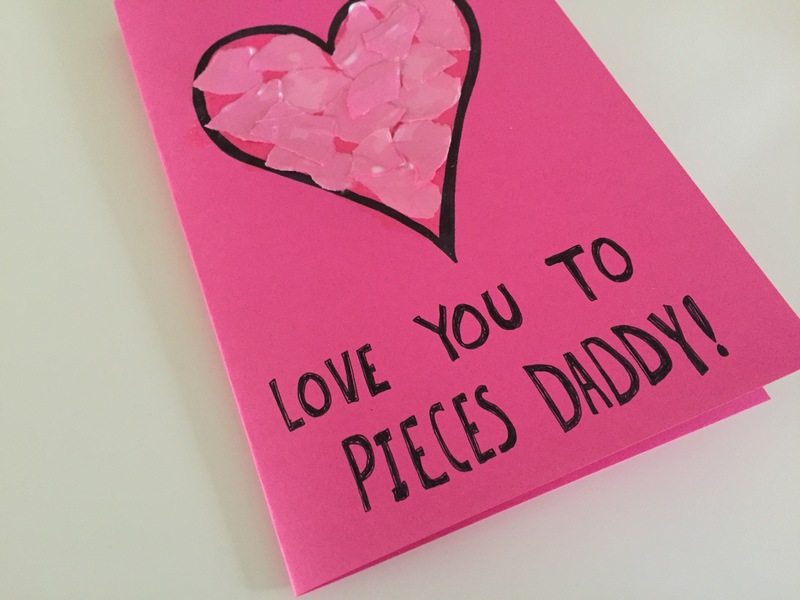 As far as card making went, Hallie and I made Valentines for daddy! She contributed by ripping up pieces of pink paper for hers. It was so much fun! 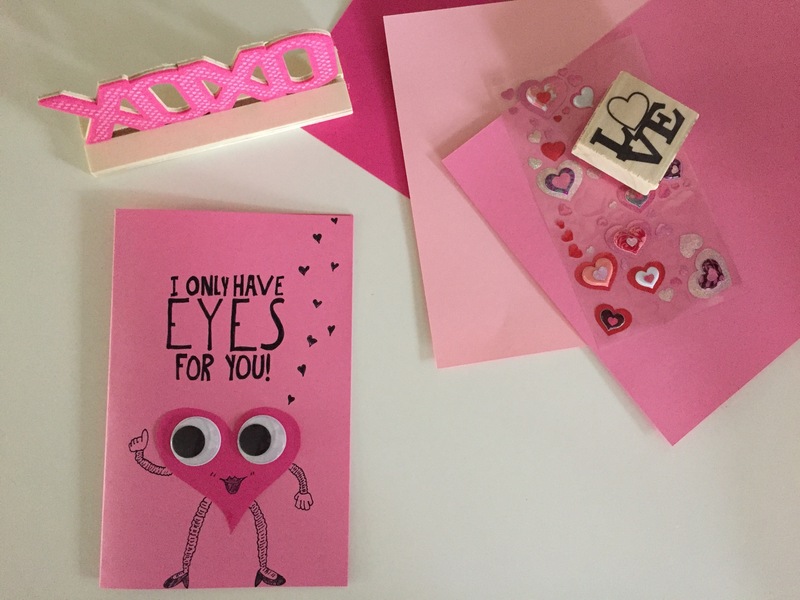 I think we have definitely started a new tradition of making our own Valentines versus buying them. Which also makes me curious about Valentines Day traditions. Do you have any that you repeat every year with your husband or family? I would love to start a few! Looks like I have something else to search for on Pinterest….. !!!! Have a wonderfully romantic Valentines Day weekend everyone! 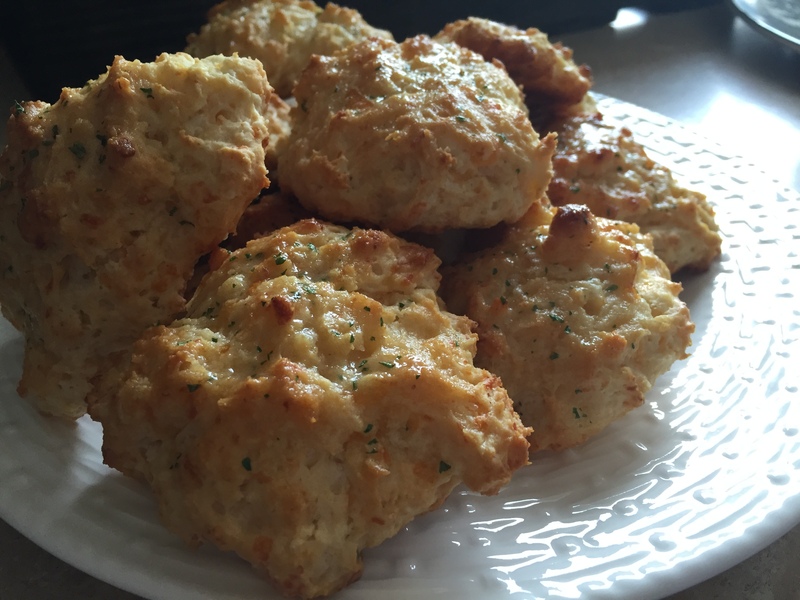 First time @ making scones…. Filing under easy and delicious! 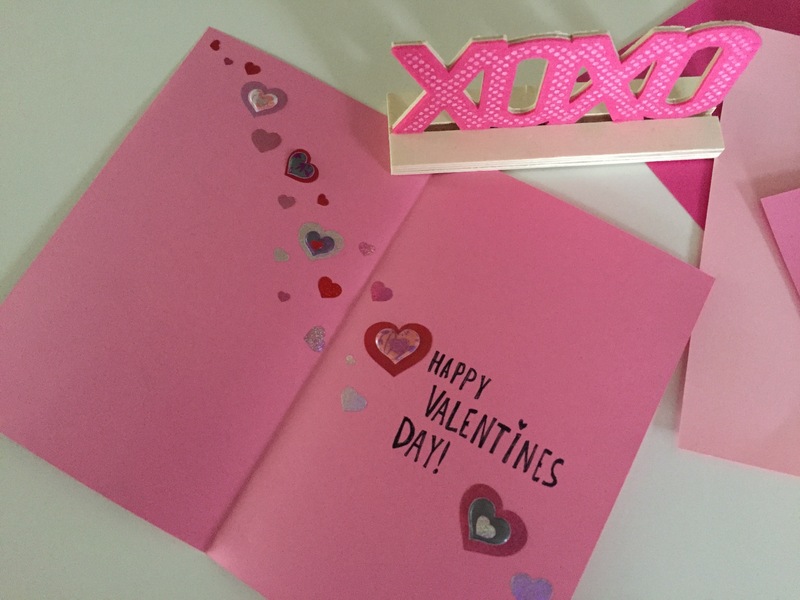 Valentines Day Card Making – courtesy of Pinterest ideas of course!